On Sunday, September 30, 2018, over 150 Silicon Valley high-level professionals and seven California winemakers will attend the 13th Annual Soirée du Vin Wine Auction held at the Fremont Hills Country Club in Los Altos Hills. Hosted by the International School of the Peninsula, annual proceeds from the wine auction support the school’s Charlotte de Géry Endowment Fund, which builds a strong financial foundation for the school’s future. 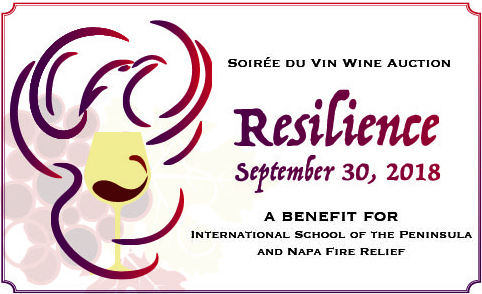 This year, however, 10% of the event's net proceeds will be donated to the Napa Valley Community Foundation's Disaster Relief Fund to aid in the recovery efforts of the Napa community. The Soirée du Vin Steering Committee elected the theme “Resilience” to highlight the incredible community efforts dedicated to rebuilding the area. After leaving the event in October 2017, this year’s keynote speaker, Jean-Noel Fourmeaux, entered a devastating week of trying to save his home and vineyards. He has remained positive throughout and has focused his energy in rebuilding during this difficult time. The Steering Committee is humbled to have this opportunity to support the larger Napa community. The impressive winery lineup includes Au Bon Climat, Clif Family Winery, Partage Winery, Ridge Vineyards, Testarossa Winery, Thomas Fogarty Winery & Vineyards, and VGS Chateau Potelle. Many of the vintners in attendance will be the winemakers or owners themselves, personally pouring some of their best wines for guests. Soirée du Vin guests have a passion for fine experiences. Their joy in this event lies in their search of an exceptional bottle for their private collections, savoring a gourmet meal, as well as finding unique experiences. Guests can expect to enjoy an evening of fine wine, an exquisite wine-paired gourmet dinner, and a lively auction. With tickets priced at $275 per person and the event selling out the past two years, this is a premier event that should not be missed. Visit www.soireeduvin.org for more details about the event, opportunities to sponsor and advertise, and to purchase tickets and tables. Please contact the planning committee at soireeduvin@istp.org or (650) 251-8502 with any questions or your interest to participate.